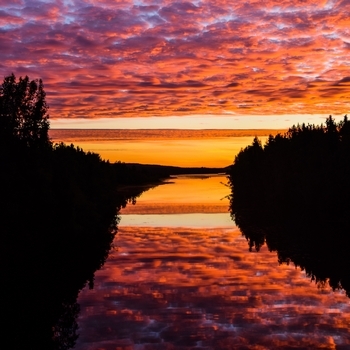 Here is about everything you need to get ready for your trip to Great Alaska. 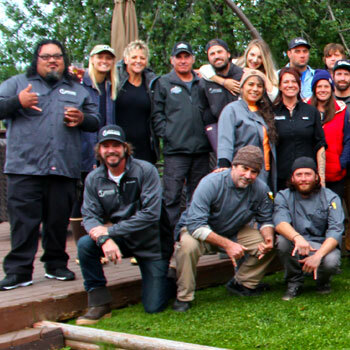 PLEASE MAKE SURE WE HAVE A CELL PHONE CONTACT FOR YOU PRIOR TO LEAVING FOR ALASKA. Seward or Whittier pickups available for an additional fee at the cruise ship docks. Pickup time is 8:30 a.m., and you'll be at the lodge in time for check in at 10:30. These pickups are by pre schedule only so speak to your adventure expert when booking your trip. South from Anchorage on SEWARD HIGHWAY - 45 miles around Turnagain Arm (watch for tBore Tide/ Beluga Whales). Road heads uphill into the mountains. 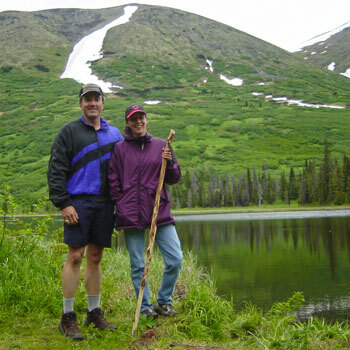 Travel 45 more beautiful miles along Kenai Lake and Kenai River to Sterling, Alaska. when you CROSS MOOSE RIVER BRIDGE- THEN TAKE 1ST DRIVEWAY ON THE LEFT. 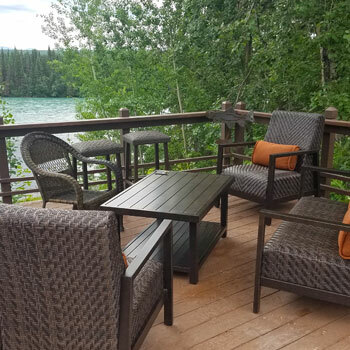 Lodge is immediately after the Moose River Bridge (only 50 feet from end of bridge). Enter driveway - take immediate LEFT in roundabout and head down to our office on the river for check in. For those driving in, road construction is a fact of life in Alaska! Please plan on leaving by 7:00 a.m. from Anchorage and you'll have plenty of time to stop for photos, Moose or road work. Packing light is always a great ideas - but in Alaska it may be even more important to pack right. 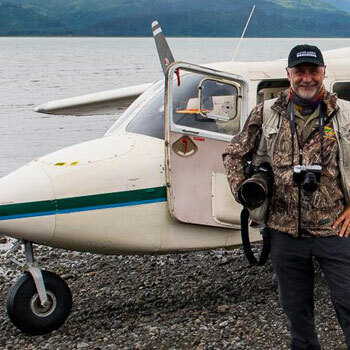 Restricting your gear to 1 large duffel and a medium backpack or waterproof "Dry Bag" is an excellent idea, as hard sided luggage doesn't do so well in Alaska bush planes. We also offer a laundry service at the lodge so you can can pack lighter, and wash your gear during your stay if you choose. We recommend quick drying "adventure wear" style safari pants and shirts, plus a comfortable set of long underwear (tops and bottom). Lastly, be sure to have as good a pair of rain gear as you can justify, along with good waterproof footwear, and you'll be set. Add a stocking cap and ball cap, sunglasses, a handful of ziplog baggies, bug spray, sunscreen/moisturizer and you'll be set. Throw in a small container of hand sanitizer...you don't want to get sick traveling through the airport on your dream Alaska adventure! 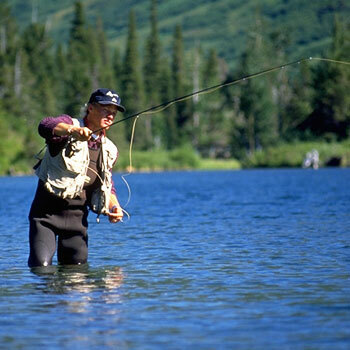 Fishing enthusiasts check our fishing gear lists for more pescatorial based info! Guides: Your daily safari or fishing guide is typically tipped 25.00 - 30.00 per day per person. "In hand" at days end is customary within the guiding industry, however you may of course choose to tip them at trips end as well, with any other tips you choose to leave. Again, the above is all a guideline for your information only. No one will reach out a hand during your trip - tips are completely at your discretion, and some guests choose to tip far above the recommended guided lines above and some below- In the end it is your decision. If you have any questions, please contact our office. 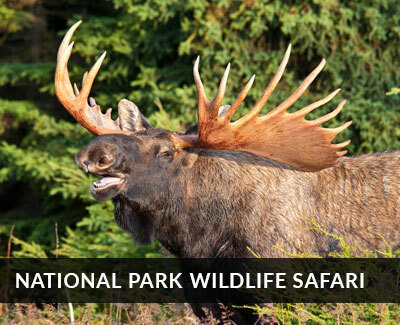 Returning to Anchorage: is not included in overnight packages (except BearCamp® only trips). If you drove in, reverse the process! Plan on 135 miles or 2.5 - 3 hours to get back to Anchorage. 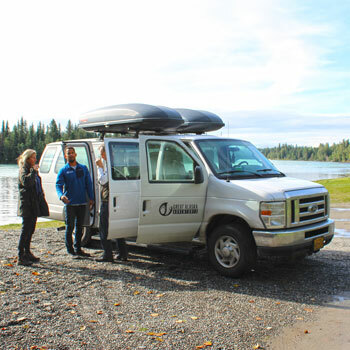 Commuter air from Anchorage: ($175.00 per person) After checkout at 2:00, a Great Alaska driver will shuttle you to the Kenai airport for the 25 minute commuter air back to Anchorage - 25 minute flight, arriving Anchoroage from 4:00 - 5:00 each day typically. 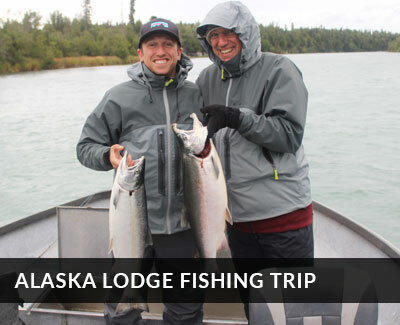 .Alaska Fishing license prices change each year, however they are available at the lodge upon your arrival, but you buy them online here Fishing licenses are available online here. 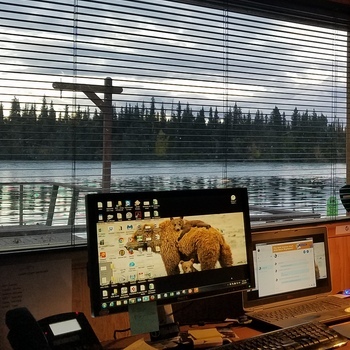 Prices as of 2019 averaged about 20.00 per day plus about plus15 a day for King Salmon Stamps (requried to fish King Salmon). If you don't fish for kings you are not required to have one. If you are in a boat where Kings will be fished, you will be required to have one. It is a fishing license, not a harvest card. 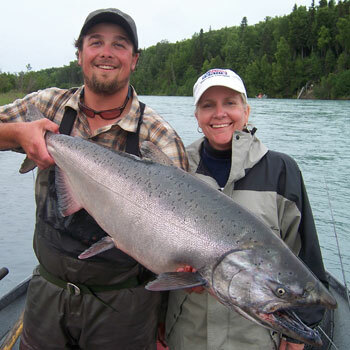 We catch and release with all Kenai River Kings. PLEASE NOTE: King salmon stamps are only required if you will be targeting King Salmon during your stay with us. 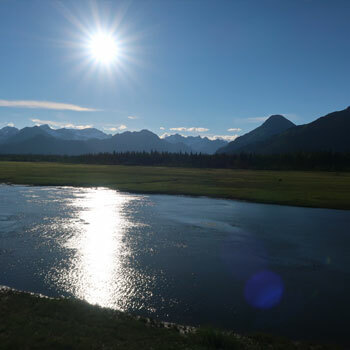 (Kings typically available June/July time frame on the Kenai and Kasilof Rivers, and in June/June offshore). Ask your adventure expert if you'll be targeting Kings during your stay. You cannot target kings without a valid stamp- they cannot be purchased after the fish is caught ! :) Prices for 2017 as displayed on line as of when I type this are as follows: (Kids under 16 years of age, do not need to purchase a license- a free "harvest card" will be issued). 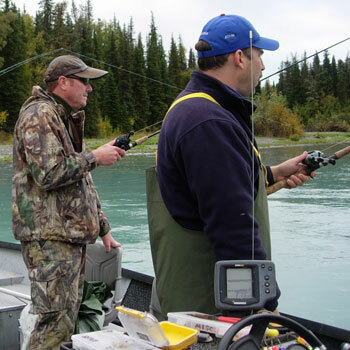 If you are fishing after July 31, you will not require a king stamp.